Before it arrived, I was most excited about the chair mode, particularly as we had tried the ZipZac chair and liked it – C even tried to push the wheels. Unfortunately our funding request for the ZipZac was denied, and while I am still hoping for a reversal of that decision, I thought the Scooot might be an alternative – it’s just slightly less expensive than ZipZac. 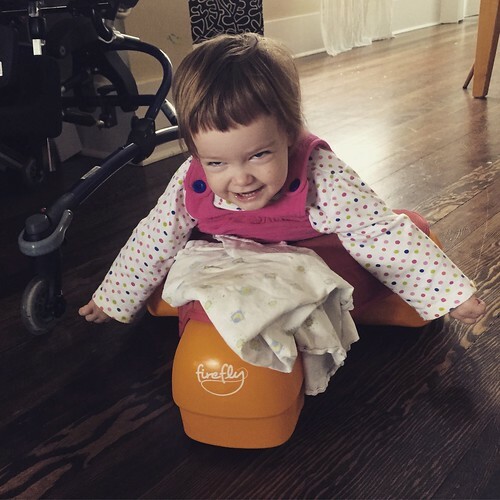 As it turns out, for us it doesn’t meet the same need as the ZipZac as it is considerably less supportive and C doesn’t have the trunk strength to sit on it in chair mode. However, we have gotten so much use out of the tummy-time mode. Tummy time is a mega-challenge for C because her arms are very high-tone (i.e. spastic). She also has very low tone in the trunk. 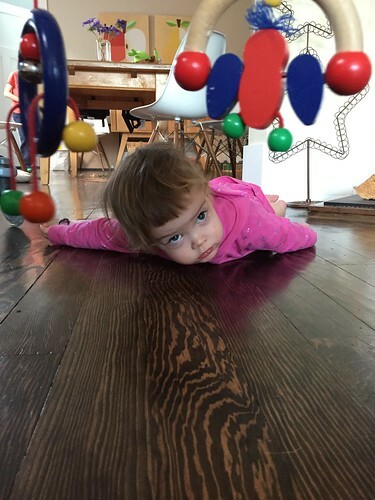 That means that when she’s on her tummy, she has great difficulty getting her arms forward to push off the floor, which in turn means she doesn’t develop core strength that we need to do so many other things. For some reason I feel like tummy time was easier for her when she was younger, but perhaps I just took pictures when she did it for a second, and now I assume she could do it for longer. Anyway, the Scooot brings her arms forward for her and lets her get into that Cobra pose position that is so important for trunk strength, and shoulder and arm strength. When she’s on this thing, we can roll a ball to her and she can bat it to us. Or she can stare at trains. Or investigate the straps on her highchair. Within a week of it arriving, C had figured out how to move around on it. I’ve talked before about the glacial pace of CP, so that was nothing sort of a miracle. She even chased the cat! Moving independently is a whole new thing for her. I optimistically call her gait trainer a walker, but the truth is the “walking” only happens with a whole lot of coaxing and assistance. The scooting (scoooting??) is totally on her own. Unfortunately, she soon developed blisters on her feet from pushing off and hasn’t been as keen to move around, but I’m sure once her feet are better, she’ll be at it again. Both the independence, and the reciprocal movement of her feet, should help her with the walker too. Maybe even with sitting… but we weren’t going to talk about that, were we? So yes, I’m pleased. I bought it with the knowledge that there is a fairly decent return period, but I can say for sure we will be holding onto this thing despite the hefty price tag. In future I hope C will get use out of the other modes too. I must say, while it’s not particularly difficult to change the modes, it does involve bolts, and washers and several Allen keys, so we’ll probably stick to tummy mode for quite a while. 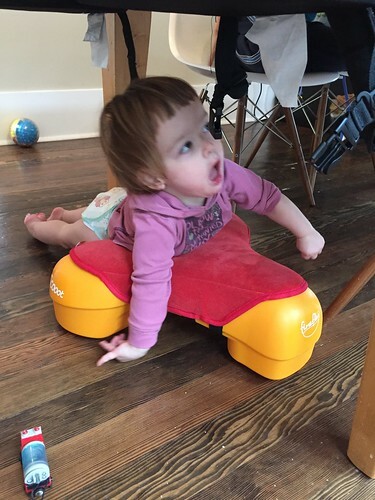 C also has some other very cool devices to get more moving, like her new toy car. We’re using that outside though as our house is not large enough for it but if you check me out on Instagram you can see pictures of that too. I didn’t get it on film, but my favourite moment so far was when she totally ignored us telling her to stop. Every toddler should have that prerogative!